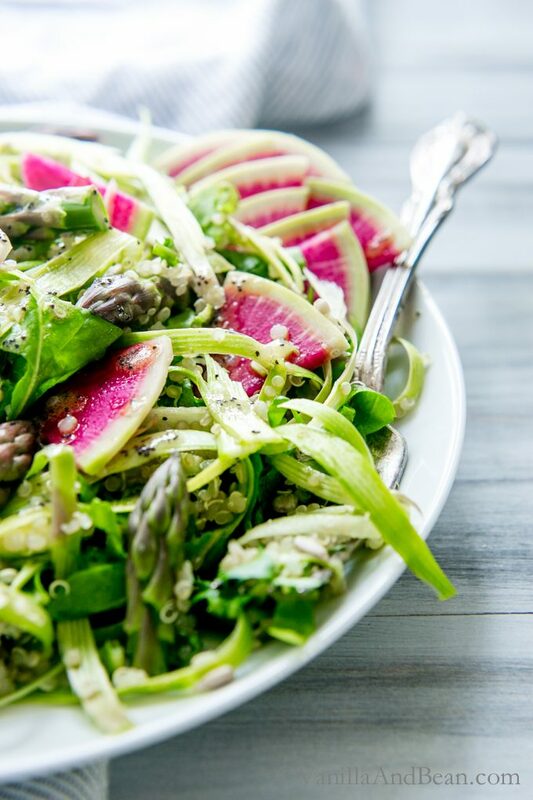 Texture, flavor and oh so nourishing; Shaved Asparagus, Arugula Quinoa Salad with Lemon-Dijon Poppy Seed Dressing . Make ahead for weekday lunches, picnic or potlucks. Vegan + Gluten Free Disclosure: This post is brought to you by Bob’s Red Mill. Taxes are done. One less thing to think about until next year. Rob and I don’t typically procrastinate, but with taxes, it seems like a push every year. Now that they’re behind us, there’s plenty reason to celebrate. But we’ve also another reason to celebrate. Earth Day is Friday. It’s a movement that began in the 1970’s by John McConnell as a way to bring about environmental awareness. It focuses on educational and actionable activities anyone can participate in, in order for people to get involved and become aware of impacts the now 7.3 billion (other estimates at 7.8), and growing exponentially, humans are having on the planet. Earth Day has been influential in getting laws passed such as The Clean Air Act and Endangered Species Act, among others here in the U.S. This year, in New York, President Barack Obama and President Xi Jinping of China will sign the Paris Climate Agreement as a show of unity as the two countries continue working together on the pressing issues of climate change. In addition, over 150 other governments will be signing on, as well at the United Nations on the same day. The good news about this is it will most likely bring the Paris deal to fruition prior to the 2020 deadline which means quicker action on a reduction of CO2 emissions. I remain hopeful, but skeptical, that our country will have the political will to see the agreement through due to the divisiveness on the issue. One activity I’ve planned for Earth Day is planting herbs in the garden that are free of neonectinoids. I called two nurseries and asked if their plants have been treated. One told me I’d have to call each grower that provides plants to this particular nursery to find out. In other words, they didn’t know. The next one I called said they are very concerned about the issue and require their growers to sign a document stating that they do not use this class of chemicals on their plants. I appreciate their foresight and action on this matter. They will be getting my business. Maryland just partially banned neonectinoids, the first state to do so at the consumer level. It’s time to call my representatives. For me, beyond planting herbs, trees, working with an environmental organization and making conscious choices in order to live lighter on the planet, Earth Day is a time to reflect on the services Earth provides. Feeling gratitude for clean air and shelter for me, my family and wild things trees provide, water purification, natural recycling, seed distribution and planting, medicinal plants, pollination, food, adventure, or solace in the songs of birds, just to name a few. We depend on and are connected to natural systems even if it seems we could go about our daily lives without them. We cannot. This Earth Day, I hope you’ll join in celebrating the day or weekend by volunteering with a local organization, finding local food, choosing organic, getting involved whether talking with your elected officials, your nursery about neonics, store produce manager about bringing more organics in, taking a walk to appreciate our beautiful Mother Earth, or learning new ways to reduce our collective impact on the environment. Use Earth Day Network as a resource to find local events. Each one of us can make a difference. 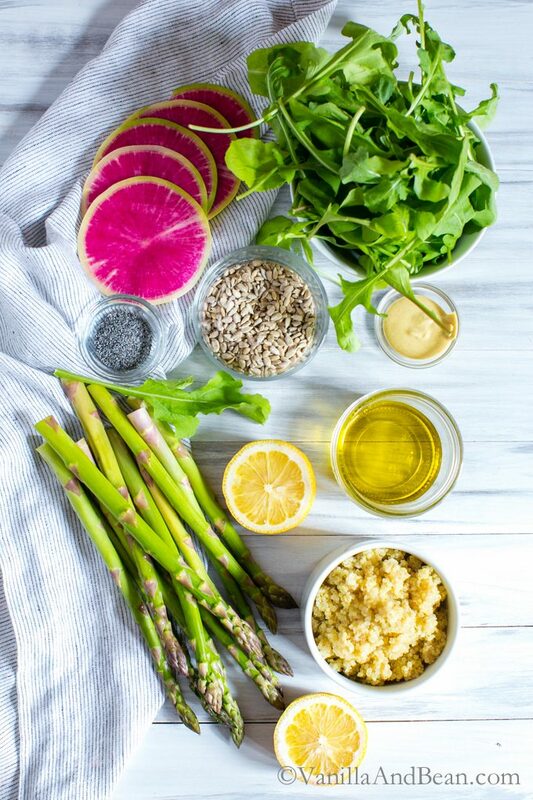 In celebration of Earth Day, I’ve partnered with Bob’s Red Mill to share this vibrant Shaved Asparagus, Arugula Quinoa Salad with Lemon-Dijon Poppy Seed Dressing. Inspired by Liz’s Shaved Asparagus Salad a few weeks ago, when I spied watermelon radish and asparagus at our Co-Op, arugula from the farm and was brainstorming recipes using Bob’s quinoa, it was a no brainer. You’re going to love it. Be sure to check out Bob’s Red Mill on Facebook, Instagram and Twitter for even more deliciousness! I’d love to hear your plans for Earth Day, or as I call it, Earth Weekend! Does your community hold special events? 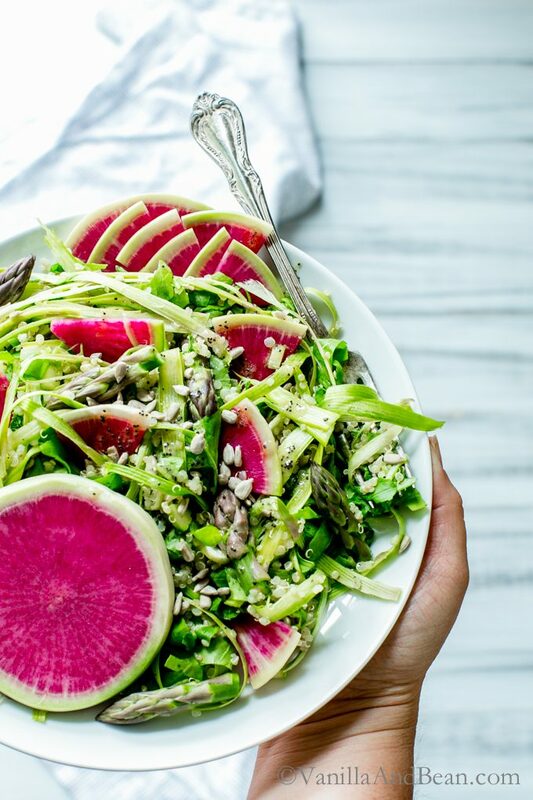 In a large mixing bowl, toss quinoa, shaved asparagus + tips, arugula, sunflower seeds and watermelon radish together. In a small jar, mix the olive oil, lemon juice, mustard, poppy seeds and salt. Shake well. Toss salad and dressing, adding a few Tbs of dressing at a time until desired taste is reached. Add a few grinds of fresh pepper and adjust to taste. To Cook Quinoa: Rinse quinoa under running water. Add 2/3 C (122g) quinoa and 1 1/3 C (336g) water to a small sauce pot. Bring to a boil, reduce heat to low. Cook for 10 minutes. Remove from heat and let set, covered, for 5-7 minutes. This salad is so beautiful and sounds like a delicious combination! Pinning! I always feel like I learn something from your posts, Traci. I had heard about the Paris agreement thanks to my husband. He studies biofuels so he’s very passionate about reducing our impact on the environment. But I didn’t know about neonectinoids. I only have a small patio garden that I plant organic veggies in but I will be sure to keep that in mind when I hopefully own a home with space for plants one day. Thank you for sharing your knowledge with us! This salad is gorgeous and I can imagine it was a delicious way to celebrate Earth Day. That color of that radish is stunning too! Right on! How interesting, Sarah, biofuels… ! I’d love to hear what he’s learning. Neonectinoids are some nasty chemicals… they’re sprayed on so many commercial crops. Good to hear your planting organic veggies! YaY YOU! Such a gorgeous salad, Traci. Simple, no fuss, and so flavorful! I love it. Thank you for sharing such an informative post – I always appreciate your heart and passion. xoxo. This gorgeous salad is just perfect for Earth day! I am in love with those watermelon radishes, I have never been so lucky as to find them here but I’ll keep looking ;) Thanks for the info on the neonectinoids, I haven’t heard anything about them here in Canada. What a beautiful way to celebrate nature’s offerings. 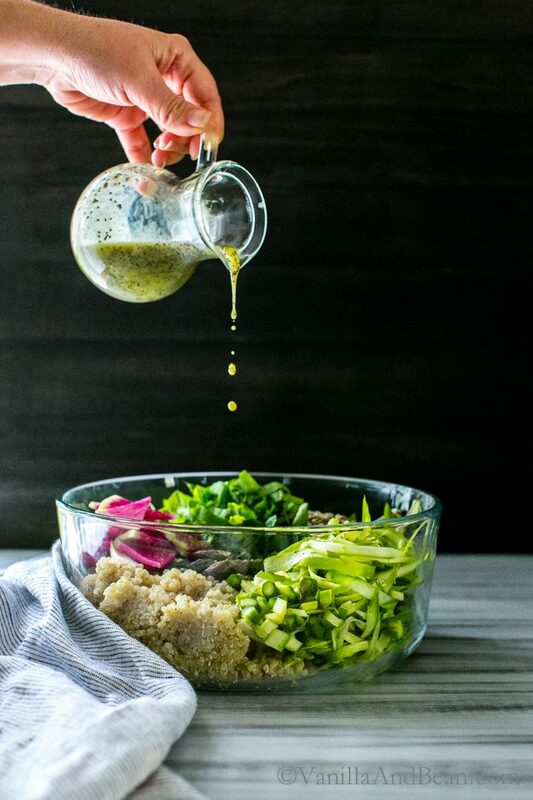 This salad is full of light – just brilliant (and so is that punchy dressing!). Love what you’ve done with the asparagus – such a creative presentation. Happy Sunday my friend, x. Thank you, Kelly. You’d love this… and that punchy dressing? I can imagine you’ve plenty of lemons to whip this one up! I love the colour that watermelon radishes add to salads! This one looks perfect for spring. I’m glad we celebrate earth day to raise awareness but at the same time, I wish we thought of every day as earth day. I get so appalled by some peoples’ (and unfortunately, some large companies’) complete lack of concern for the environment! You’re welcome Keith! I hope you love it! This salad feels like the most beautiful way to say Happy Earth Day! Thank you for sharing your thoughts about Earth Day – it’s easy to get caught up in the hustle and bustle of life and it’s a very great reminder to take action in your decisions. My goal for the weekend will be to freshen up our garden (namely pulling weeds and cutting down plants to make room for new growth!). I tried to mow the lawn while wearing a sleepy baby this afternoon, but it turns out the push mower is a lot harder than it looks…. Heyyy Sarah! Thank you. It IS easy to get caught up in our fast paced lives. I get it! Sometimes convenience can get the better of me if I’m not mindful. I find getting into a habit takes quite some time before I make it a regular practice. I still sometimes forget my cloth bags or get in a hurry on a busy Saturday morning and skip the farmers market. I’m constantly working on better organizing myself so I can improve those good habits. Another super informative post, Traci! I buy herb plants a lot so will be checking with my local nursery about neonectinoids – thanks for the heads up. Now for this salad – the watermelon radish looks like a cartoon radish! The color is just gorgeous – I will definitely have to look for that at my local market – never seen one before. And I love everything going on in this salad – I could eat it every day for lunch – just delicious! Thank you for speaking up so loudly and eloquently about the importance of looking after our earth and the bees. If our politicians don’t always take action to protect our planet and the creatures on it, each of us , as cooks and as eaters, can have a huge impact on the planet by purchasing food from farmers who share our environmental philosophies and concerns. Hi Heather! Unfortunately many of our politicians have financial incentives from those who are not in the business of protecting the environment. Thats why it takes citizens like us to make informed choices with regards to environmental impacts. No doubt, purchasing food and products that are in alignment with our environmental ideals are a great way to vote! I loved reading your thoughts on Earth Day! I’m just finishing up my biology degree so much of what you said resonated with me :) I’m also hopeful/skeptical about reaching our carbon emission targets. On to this salad- wowza it is beautiful! And that dressing sounds deeeelicious! Traci, this salad is ridiculously gorgeous! I’ve been wanting to try to make a shaved asparagus salad for so long…looks like I found a recipe! Love adding quinoa to salads. I love the extra protein and the texture it adds. So proud of you for being so proactive in helping to save the bees. It’s such a disturbing loss and we need more people like you to spread the word. So, this Earth Day, I’ll be prepping my daughter for her senior prom…yikes! But, my husband and I are planning on cleaning up our yard to prep for Spring planting…my absolute favorite time of year! Thank you, Caroline. No doubt about the bees, but they are only the icon. It goes wayyyy beyond the bees. Kinda like DDT and Eagle shell thinning years ago. Eagles were the icon. But you know, even though it’s banned in the US, we’re still dealing with DDT today due to bioaccumulation in the food chain. Beautifully done salad Traci!! Happy Earth Day, and your post was beautiful… and meaningful! Thanks for the information,,, something to think about deeply! So inspiring and such a great way to celebrate Earth Day! And this salad is absolutely stunning – this salad looks so delicious and refreshing- a wonderful tribute to spring! 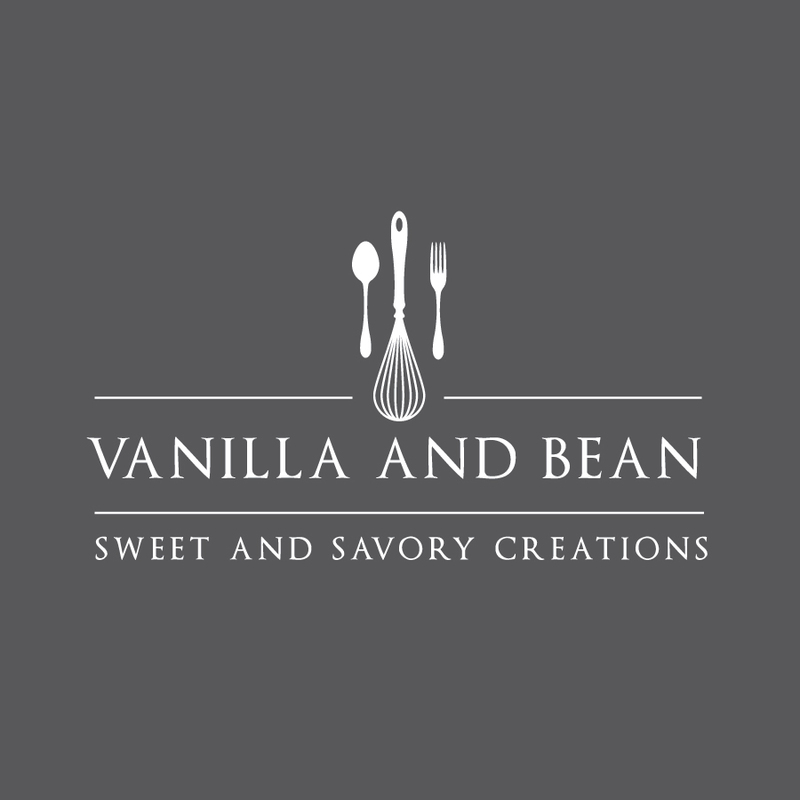 Love all the info I always get from your blog Traci! This is such a gorgeous salad! Love it! Need to get some watermelon radish! You are always a wealth of information, Traci, and I can feel your passion through your words. One of the many reasons I adore you and your site. Obviously your food is another reason! ;) This salad looks delicious, dear! 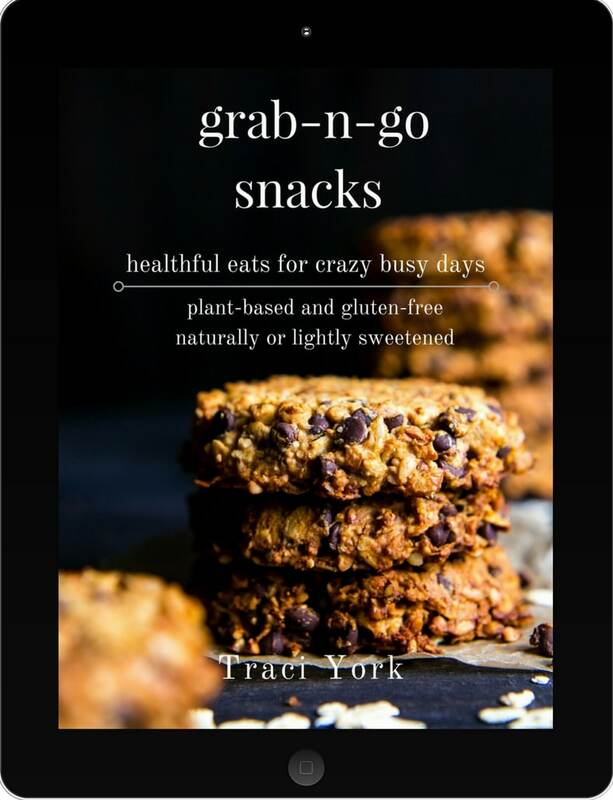 You included some of my favorite things is this healthy beauty! And I’m absolutely loving that lemon-dijon-popppy seed dressing! Most definitely making this for lunch today or tomorrow! Pinned! Cheers, dear! What an incredibly gorgeous salad Traci and a wonderful way to celebrate Earth Day! I LOVE shaved asparagus in salads. And that watermelon radish…just beautiful! 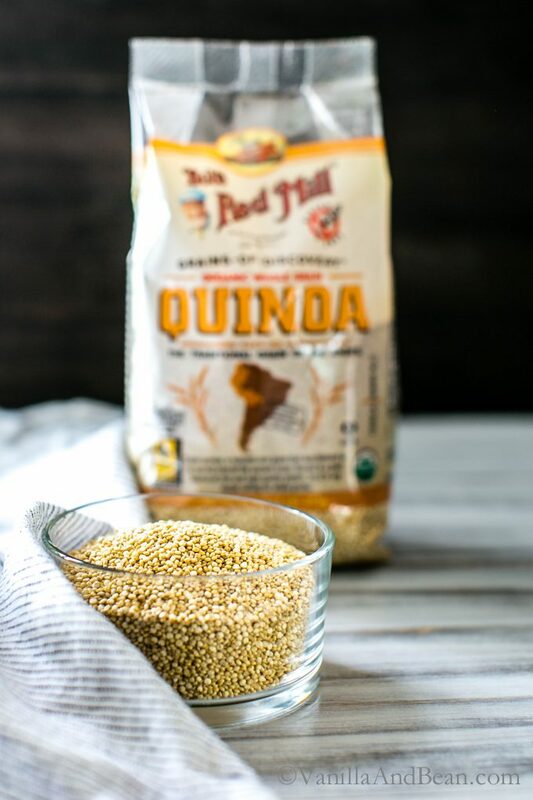 I love the addition of the quinoa and the light poppy seed dressing too. Salad perfection! Happy (almost) Earth Day, Traci. I think this salad and a little gardening is the perfect way to celebrate! It turned out absolutely gorgeous. Glad you found some watermelon radishes! XOXO! Happy earth day to you too Traci. I just bought some asparagus the other day. I was planning to put a Mediterranean twist on it, but I love how you paired this with a simple olive oil and mustard vinaigrette. I can never find watermelon radishes around here and they look so good in this salad. So well done, my friend. Thank you Aysegul! Mmmm a mediterranean twist? I’m intrigued! That mustard is such a classic, but I can’t seem to get away from it. I love it. You know, I talked with our co-op produce manager about this. Un-cut, they look like large turnups! They started cutting one open so customer could see they weren’t turnups! lol The farm had them in the Fall and they were so strong, I couldn’t eat them. But the Spring variety have been so mild! I love how passionate you are about this issue! I never thought to ask when I bought my herbs at the farmer’s market, but you bet I’ll be checking up on that next time. What a gorgeous salad! I’ve never tried watermelon radish before, but I’m super curious to give it a try now! Ugh… I have to do something. I can’t imagine knowing these things and not doing anything. I gotta sleep, ya know? If you bought your herbs from the farmers market, you’re probably okay. It’s the larger growers it seems we need to be more concerned with. But it never hurts to check. For the longest time I shyed away from radish because I thought they were too strong and I’d never tried a watermelon radish. But I started eating them and watermelon radish. I found the Fall variety of watermelon to be really strong.. but the Spring variety is very mild and is sooo crisp. It’s such a vibrant root veggie! I hope you enjoy them Liz! What a wondeful post for Earth Day. 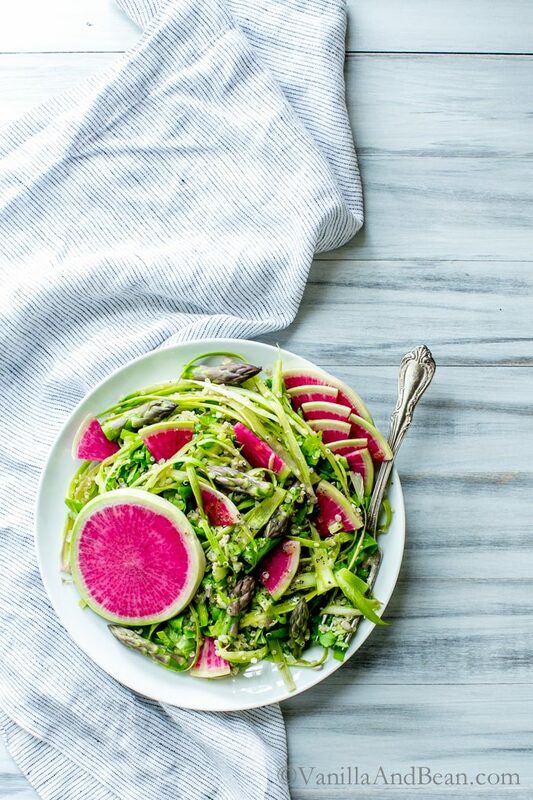 The shaved asparagus salad sounds and looks wonderful! Thank you so much Shumaila!